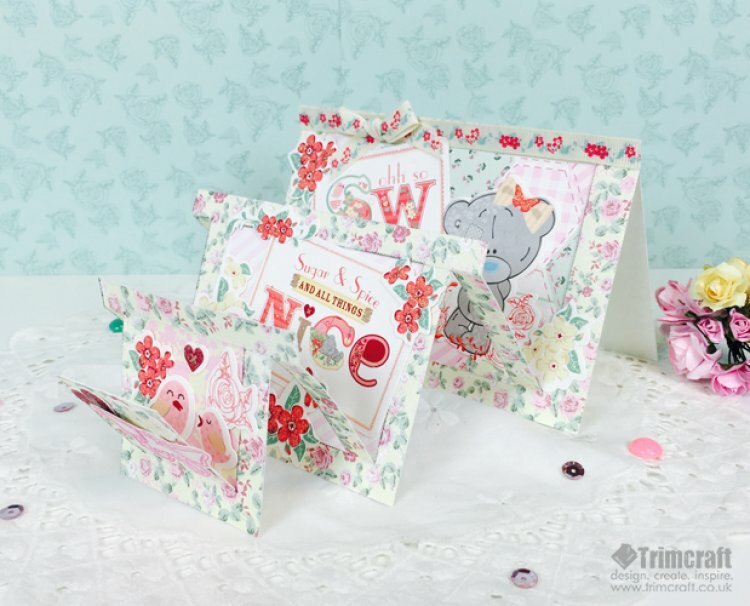 Angie has used the adorable First Edition It’s A Girl Paper Pad and the Me to You Tiny Tatty Teddy Girl papercraft collection to make this sweet card, perfect for a little girl’s birthday. 1. Cut two pieces of the First Edition cream floral textured paper to 14.9cm x 9.9cm. Score the top of the cards 1cm from the top. I have then stuck the scored sections of the card together to create a card blank. 2. Print off the template and cut it out. Place the template onto the front of the card and use the paper piercer to pierce a small hole at every corner of the 5 squares and remove the template. Make sure the card is open flat so you do not pierce through to the back of the card. Tip: Add some foam behind your card so you can easily pierce the paper. 3. With the template and pin pricks as a guide, draw in the black lines only with a pencil. With a scalpel or blade, cut the pencil lines. Score the paper where it has been indicated on the template. Use the rubber to remove the pencil guides. 4. Separate the sections and apply double sided tape to the back of the 3 frames and add double sided paper to cover the centre of each frame. 5. I have the added the ‘Oh so sweet’ and the Tiny Tatty Teddy Girl stickers to the centre of the largest frame. I have then decorated the frame with a red glitter flower sticker on the top left of the frame and cream glitter flower sticker to the bottom right. 6. In the second frame, I stuck the ‘Sugar and Spice’ sticker at a slight angle and surrounded it with a flower sticker and a pink bird sticker. 7. For the smallest frame, I created a love bird scene by added a glitter flower and rose sticker to the frame and adding two birds to the centre. Add a small glitter heart above the birds. 8. On the front of the card, I have added a glitter heart and flower sticker. Using the Tiny Tatty Teddy stamp, stamp the ‘Hello Beautiful’ butterfly sentiment onto the pink striped paper with the Pink Dovecraft Pearl Effects. 9. Finally, cut a piece of cream floral ribbon to 14.9cm and add to the top of the card to cover the score lines. With another piece of ribbon, make a bow and stick on top of the ribbon. This card definitely has the wow factor and can be adapted to many different designs. We would love to see your version of this Card Shape of the Month so remember to upload and share them into our project gallery.